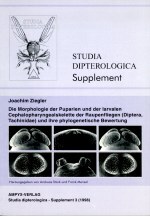 Order of a subscription of "STUDIA DIPTEROLOGICA"
Order of single volumes of "STUDIA DIPTEROLOGICA" and/or of the monographs of "STUDIA DIPTEROLOGICA SUPPLEMENT"
Prices for the STUDIA DIPTEROLOGICA are calculated on a sliding scale according to the method of ordering (see prices). Because of the considerably lower administrative costs, subscribers will be allowed from us an annual discount of 25% towards the cost of single volumes. To qualify for this discount, a subscription to the journal must be taken out for at least three years, and this must be for an uninterrupted subscription period and with the same order number. The year-by-year arrangement, namely the termination and/or extension of contracts, will in the future no longer be recognised as a "subscription". Each year the customer will receive an invoice for the volume that has been delivered. The amount to be paid (the gross price) consists of the net price and the purchase tax (value added tax) that is payable in Germany. Please note that we cannot issue any net invoices on the basis of the "purchase tax exemption 2010 (UstAE)" or by reference to a purchase tax identification number (VAT ID no.). For technical reasons, only bank transfers (for the SUPPLEMENTs) and/or payments by credit card can be accepted. Please do not pay until you receive an invoice from our accounts office (Senckenberg Gesellschaft für Naturforschung Frankfurt/Main or Ampyx-Verlag Halle/Saale). 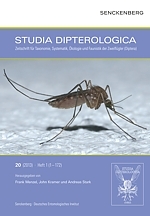 If you wish to pay for STUDIA DIPTEROLOGICA with your credit card, please send the number of your credit card, the expiry date of the card, and the security code to Dr Frank Menzel (frank.menzel@senckenberg.de). With each credit transfer please give your customer number and the invoice number.